April is National Stress Awareness month! I am celebrating Craft Yarn Council style, and I am making lemon stress balls! This month, we take note of what causes us stress and rid of them in a healthy way. Standing in a slow line? Take it out on a lemon while you wait! Be aware of what stresses you out and find a healthy outlet. My go-to is crocheting, but other crafts work for me too. I try to scrapbook and knit. Whatever floats your boat, maybe you enjoy floating on a boat! Keep in mind that having a hobby does not mean the stressor goes away permanently. if your taxes are stressing you out for example, settle them ASAP. Neighbors getting on your nerves? Talk to them about the issue, and move on to the proper authorities if they’re not cooperative. Do something to help the situation, constantly running away from it does not always help. 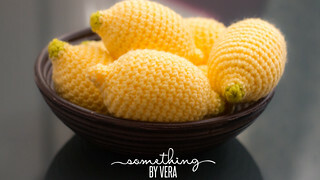 Want to crochet lemons too? The pattern I’m using is linked below. Check out the hashtag #stitchawaystress on social media to see what others are making for National Stress Awareness month!